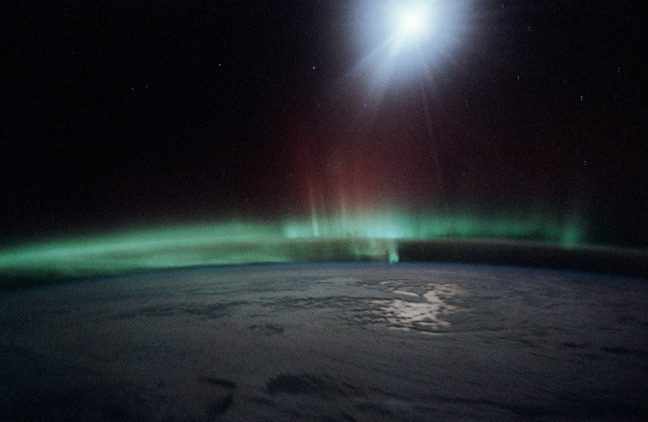 A solar storm, aurora from space, and aurora on Earth. Create blackouts on Earth when they cause surges in power grids. Understanding the changing Sun and its effects on the solar system, life, and society is a main goal of NASA's Heliophysics research program. Many NASA missions focus on the Sun and its interactions with Earth. Current missions include STEREO, SDO, SOHO, ACE, SORCE, and the Van Allen Probes. Check the Current Space Weather. 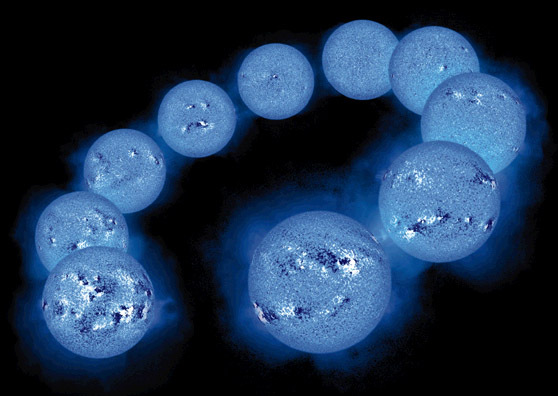 The changing Sun produces sunspots and solar storms over an 11-year cycle of activity, which is driven by the reversal of its magnetic poles over this time period. Solar storms (coronal mass ejections and flares) occur most often and more powerfully during its period of solar maximum. The current solar maximum is expected to peak in 2012 or 2013. 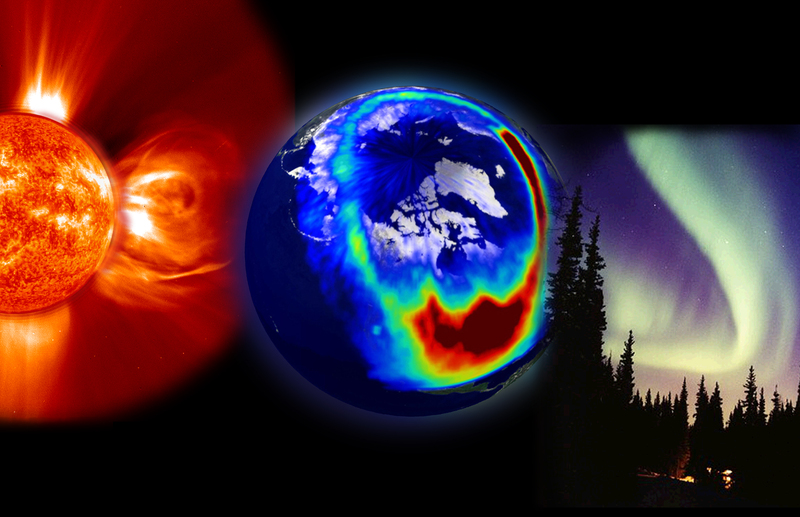 There are two kinds of solar storms, often related to each other: coronal mass ejections (CMEs) and solar flares. A flare occurs when magnetic energy builds to a peak near the Sun's surface and explodes. This intense, fast-paced event results in an intense burst of light, including X-rays, in the Sun's lower atmosphere. A much larger storm, a CME erupts when magnetic field lines snap, sending billions of tons of material into space at millions of miles per hour. The cloud expands to over 30 million miles by the time it reaches Earth. Both flares and CMEs can result in additional high speed particles being shot out into the solar system at close to the speed of light. 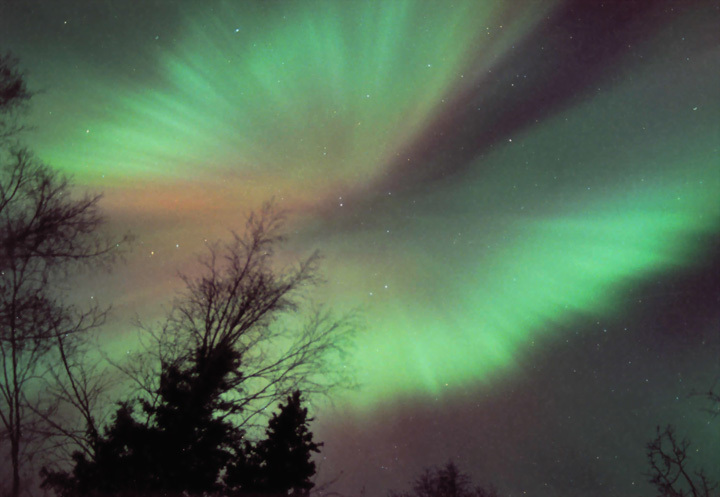 One beautiful sign of the space weather at the Earth is the aurora. When the CMEs from the sun interact with the Earth's own protective magnetic shield, its magnetosphere, the magnetosphere becomes disturbed. 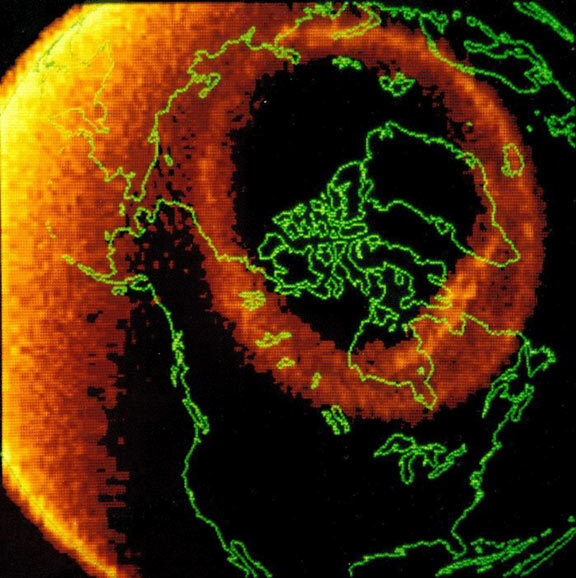 This ultimately causes charged particles to flow down along magnetic field lines into the polar regions where they hit the atmosphere and create the bright aurora. If viewed from high above Earth, these regions appear as ovals. 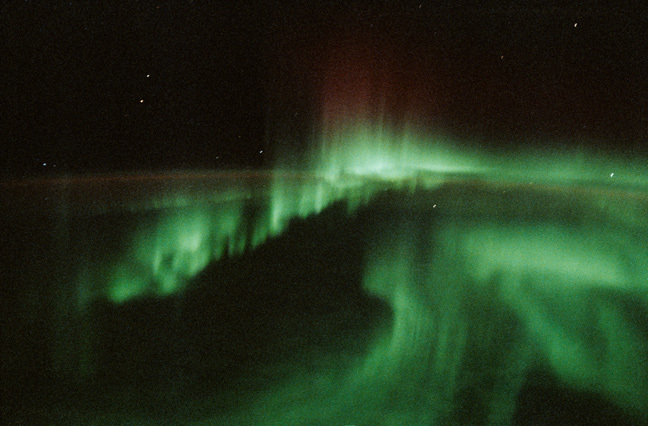 Images taken by astronauts in the space shuttles show the depth of aurora. Other impacts from space weather include short-circuiting power grids that cause blackouts, disrupting communications, damaging satellites, and endangering astronauts with radiation. 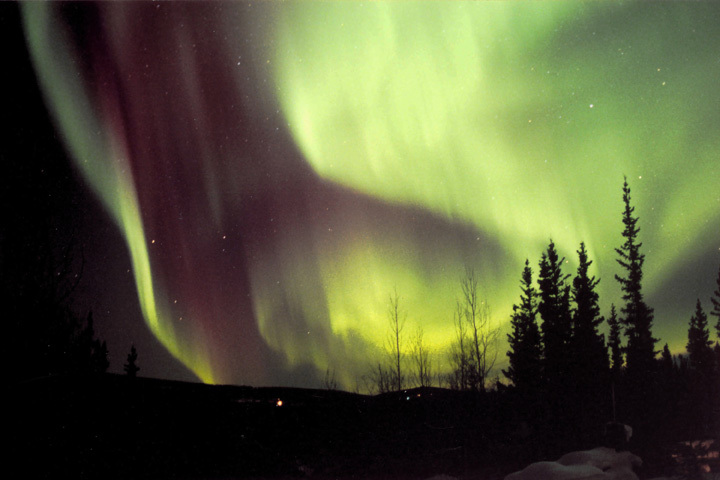 Aurora appear from Earth as shimmering, dancing lights in the night sky. Only 100 years ago did scientists discover that the Sun was ultimately the cause of these mysterious lights. Although green is the most common color, red and yellow hues are also observed. 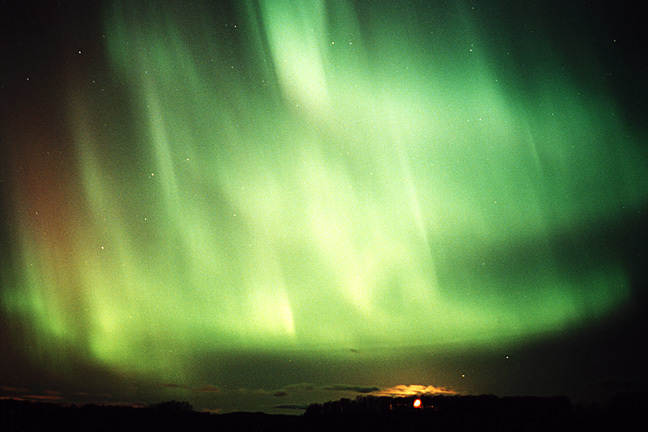 The most powerful displays occur when large clouds of particles from CMEs slam into our magnetosphere, but the constant outpouring of solar particles (called the solar wind) can cause them as well. Download the print version Space Weather poster. Download the Spanish version Space Weather poster.